I was invited to give a talk at TEDx Brussels. I explain Identity in the context of the Future. Enjoy! In 2004-5 the Identity Gang (user-centric identity community) was 1/10 the size of the current NSTIC stakeholder community. It took us a year of active grassroots effort to develop enough common language and shared understanding to collaborate. NSTIC doesn’t have 5-10 years to coalesce a community that can collaborate to build the Identity Ecosystem Framework. To succeed, the National Program Office must use processes to bring value and insight while also developing shared language and understanding amongst stakeholders participating. Survey Says: People care about securing personal data. 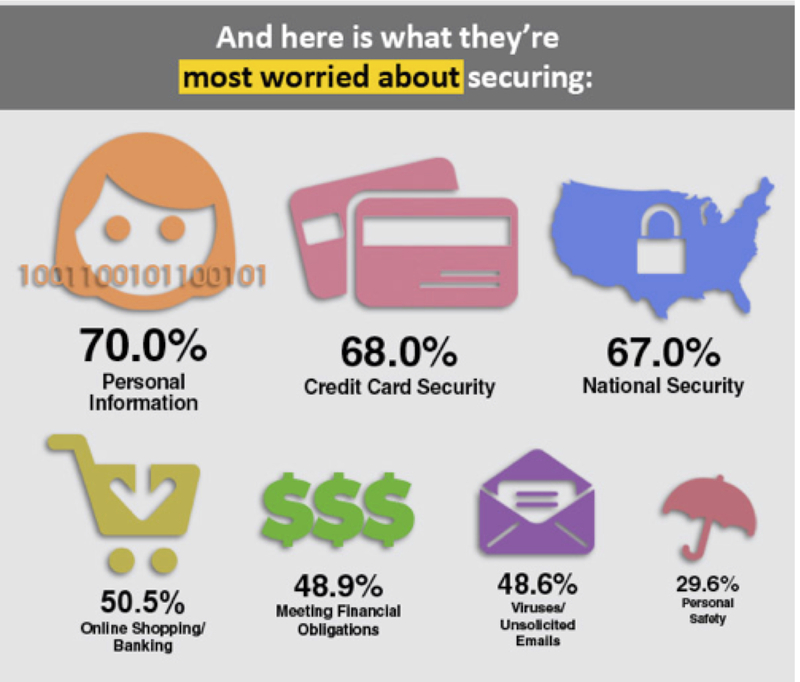 This info graphic is from a Uynisys Survey 70% of people cared most about securing their personal data. This diagram is from the Unisys Security Index Survey. You know I like social media tools and enjoy using them to share information. I am also very conscious of the implications of doing so and how public things are when I do. I manage my public persona – the parts of myself that I share publicly on the web associated with my professional work and personal passion – User-Centric Digital Identity. I went over to Plancast where it was listed and also signaled that I would be attending THEN it asked me if I would like to share via Facebook. “sure” I think that makes sense – I learned about it there why not, it is part of my professional public life online. I ONLY want to give them permission to post this one item…maybe in time I might trust them enough to have full access but that will come in time as I grow to know their service and trust their business practices. Includes name, profile picture, gender, networks, user ID, list of friends, and any other information I’ve shared with everyone. One of the things you learn early on when diving into the subject of identity is that it means many things. The sense of self is one of them. Today I ran across this article via John Hage’s facebook. Storytelling 2.0 when new narratives meet old brains.